India plays Scotland today (Thursday 16 August) in a ODI match at the Clydesdale Cricket Club grounds in Glasgow. Not surprisingly, it has been raining in Glasgow and a tinge of optimism is required to believe that this match will run its full course. If the weather does not have a say in curtailing the match duration, the Indian team might! Scotland are definitely not pushovers and since the World Cup, they have shown some improvement. But I can’t really see them offer the Indian team anything more than a pleasant sightseeing opportunity! India follow this game with a ODI against England Lions at the County Ground, Northampton. After that the 7-match circus commences on 21 August at The Rose Bowl (Southampton). From the Team India contingent for the Test matches, Anil Kumble, Sree Santh, Wasim Jaffer, Ranadeb Bose, V. V. S. Laxman and Ishant Sharma have departed for India while Robin Uthappa, Rohit Sharma, Piyush Chawla, Ajit Agarkar and Munaf Patel have joined the squad. It is likely that all of the above will play in the game against Scotland and also in the game against England Lions on the 18th. It is also likely that the players with minimal work-rate in the Test series will also play both games — namely, Gautam Gambhir, Yuvraj Singh, Ramesh Powar. We could add to this list Rahul Dravid, Dinesh Karthik and Sourav Ganguly for the game against Scotland and Sachin Tendulkar, M. S. Dhoni and R. P. Singh for the game against the Lions. Robin Uthappa, Gautam Gambhir, Yuvraj Singh, Rohit Sharma, Sourav Ganguly, Rahul Dravid, Dinesh Karthik, Piyush Chawla, Ramesh Powar, Ajit Agarkar and Munaf Patel. It is likely that Zaheer Khan will sit out both games. Dileep Premachandran asked yesterday in a well-written Cricinfo article if India would be able to step up and cross that last hurdle in the 3rd Test against England at The Oval. It was a question that was posed yesterday on this blogsite too. So often — most excruciatingly in Steve Waugh’s final Test — India have not managed to cross this last hurdle. But India did the right things right on Day-1 of Test 3. India won the toss, elected to bat and came out in a sensationally positive frame of mind. If this mindset was evident in the mercurial nature of of Wasim Jaffer’s batting, it was palpable in the purposefulness of Rahul Dravid’s stride. This team meant business and they would have reached a much more satisfying destination at the end of Day-1 but for the fact that a certain Ian Howell appeared to have got up on the wrong side of his bed! After giving a marginal caught behind decision to send Dinesh Karthik back to the hut, he chopped Sourav Ganguly at the knees with a shocker of a decision! India ended the day at 316 for 4. India had had a good day, but England are still in the game. Karthik was playing extremely well and had composed his 91 runs in style; with confidence and energy. On that score he wafted with minimal footwork at a ball from Sidebottom for Matt Prior to pounce on the catch. The England players went up as though they had just won the lottery or a date with Catherine Zeta-Jones, or both! Ian Howell, the umpire, lifted the dreaded finger and Karthik had to make the slow long walk back. I did not hear the snick. Snickometer did not think there was a snick either. However, Karthik did say at the end of days’ play, “there was a small nick, there is no doubt about that“! Phew! One less effigy to construct and then destruct for the folks in Kolkata! The Ganguly decision, however, will have generated a few thousand effigy orders! Up until that lapse in concentration, Karthik had batted very well. He was all poise, determination, inventiveness and concentration. A step down to caress Andreson through extra cover as well as an inside-out six off Panesar were special shots. In the morning, after Rahul Dravid had won an important toss and elected to bat, proceedings ran against the normal script. Karthik, the normal aggressor was quiet while Wasim Jaffer, the dour accumulator was in his elements! It was a very different Wasim Jaffer that came to the crease this morning. Indeed, it appeared as though Jaffer and Karthik had reversed roles! We saw a quiet Karthik and a different player to the Jaffer, who normally plays well within himself. Instead, he was playing out of his skin! There were some great leaves by both Jaffer and Karthik initially. Of course, the bowling was shocking to start with. Karthik and Jaffer were served some dross by James Andreson, who gave both the openers ‘ample opportunity to have a look at the ball and what it was doing’. Both Anderson and Tremlett had poor opening spells and they did not make batsmen play enough. Although Sidebottom bowled tightly, he slid too many across face of the batsmen. The openers settled down and slowly opened their shoulders. I liked the way the openers saw off the new ball. A shot by Jaffer to send an Anderson ball for 6 over third man was so Sehwag that one wondered if Sehwag himself would have been able to execute that shot any better! The only way Jaffer was going to get out was through a brain explosion. And it did happen. He played a shot that would have done Sehwag proud! It was a strong statement from Jaffer, but I’d think he needs to work on his square-off-the-side strokes to do well in Australia. India went in to lunch at 117-1 off 28. It was an innings that was paced well. India were well-placed with Karthik on 50, Dravid on 25 with Dravid looking very very determined. Dravid’s stride to the crease was purposeful. He opened with two fours and looked extremely focussed, determined and positive. If he had a message to convey to the team, he did so with panache. In the days leading to this Test match, he had already telegraphed his positive intentions. He had said that the previous two Test matches were-result oriented even though they only featured 350 overs. He said that with 450 overs expected to be bowled at The Oval, he expected a result. This was positive and tone-setting stuff from the captain. The hour after lunch saw some awesome batting; perhaps even the best batting-phase of the series from either teams. Dravid and Karthik were scoring at will. They took nearly 70 runs in 17 overs. In this passage of play it was interesting to note that England maintained a very good over rate too. One particular shot by Dravid was really special. Panesar had two men in front of Dravid — one at short extra cover and one at short mid off. The two fielders were really close to each other — within hand-shaking distance. A flighted ball from Panesar invited the cover drive. Dravid leaned into a classic cover drive and threaded the ball through these two fielders with unforgettable panache and sheer style. He really did look set for a 100 or even higher! After all, the last time he played at The Oval, he had scored over 200 runs! And then suddenly the ball started moving around quite a bit. Although Dravid was bowled by Anderson off a beauty — and normally, it is a beauty that gets Dravid out — it was really the previous over from Sidebottom that probably set up the dismissal. It was a fantastic and searching over; an over in which Sidebottom swung the ball away and asked a few questions. Dravid had played and missed a few times in that over and was clearly annoyed with himself. The first ball of the next over was a terrific yorker length ball that moved slightly away. Dravid lost his middle stump! 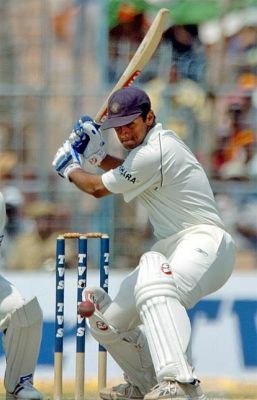 Although the ball was a good one, but for the previous over, Dravid may have, on most occasions, presented a straight bat to the ball. Instead, he closed the face and tried a cute flick to leg, perhaps in an effort to score a few off Anderson to compensate for the tightness of Sidebottom’s line, movement and length that did not afford any “gimme” balls. Soon after Karthik was out too. How Howell could have given that out, I really do not know. There was no sound of a nick. Nor was there any deviation. The benefit of doubt should have gone the batsman’s way. It did not. All of this happened during a phase in play when it was a wee-bit gloomy and there was some swing around. Andreson was in the middle of a good spell of fast swing bowling. The 50-over old ball was suddenly seaming around. Was it the overcast conditions? Or was there some jelly beans involved too? Ganguly and Tendulkar set about the reconstruction job. Once again, Tendulkar appeared shaky while Ganguly was playing reasonably well, albeit with some initial scares. I thought England bowled badly to Tendulkar. They overdid the “chin music” stuff to Tendulkar when fully pitched outswingers that invited the drive may have been a better option. Matt Prior, who was asked to “put a sock in it” had a forgettable day. He let through some 20 byes and dropped Tendulkar off Sidebottom! A costly lapse perhaps? But both teams are still in the game. I’d say that India won 2 sessions (session-1 and session-3) with the middle session being called an even one. The new ball is only 8 overs old. So, Laxman and Tendulkar will need to see off the first 10-15 overs and then start to play their shots. The stage is set for a crucial 1st session on day-2. If one of Tendulkar, Laxman or Dhoni make a big hundred, they can put the match beyond Englands’ reach. But if England manage to get 1 or 2 quick wickets, they are right back in the game. All of this makes for a fascinating day-2. Team India have a nine-day gap between the end of the 2nd Test match and the start of the 3rd and final Test at The Oval. The 3rd Test commences 9 August. In between, from the 3rd to the 5th of August, India plays Sri Lanka ‘A’ at Leicester! This is a bit wierd! I am not aware of a touring team playing another touring team — and that too an ‘A’ team — in a 3-day practice match! Could well be a first? – Whether Sree Santh plays at The Oval, and if he does, what his mental state is. – Whether Yuvraj plays at The Oval. Sri Lanka ‘A’ have some decent players in its ranks. Its one-down player, Michael Vandort, has already played 9 Tests for Sri Lanka (including those against Bangladesh recently) for an impressive average of 52.91 including 3 centuries. Thilan Samaraveera, the ‘A’ Team captain, has played 39 Tests for an average of 41.53. He has also snared 14 Test wickets with his off-spin bowling. Kaushal Lokuarachchi is said to be a useful all-rounder. He bowls legspin, bats well and has played in 4 Tests and 19 ODIs. Dammika Prasad and Akalanka Ganegama are useful fast-medium bowlers who are rated quite highly. They have both played a handful of ODIs. They will be able to offer a good practice for the Indians ahead of The Oval. Zaheer Khan, Anil Kumble, Sourav Ganguly, R. P. Singh and Sachin Tendulkar should earn a break and get some R&R. Despite the win in I do believe India needs to sort out the Yuvraj Singh question. I do feel that the process of future-building needs to commence now — and not in the future. The Fab Four will not be around for ever. Yuvraj Singh needs to be blooded and the time is now. Despite Laxman’s fighting 50 in the 2nd Test and despite Dhoni’s match-saving innings at The Lords’ I believe one of them need to make way for Yuvraj Singh for The Oval game. Apart from being an opportunity to play a future middle-order bat for India, Yuvraj Singh lends greater agility to the fielding and is also able to bowl a containing line of left-arm spin — if needed. One of the drawbacks in Team India in the 2nd Test was that there was virtually no one who could bowl an Ashley-Giles-type or even a Monty-Panesar-type of containing-line at one end. Yuvraj Singh may give India that option. Moreover, if Sree Santh appears to be still undercooked in the Sri Lanka ‘A’ game, I feel he should make way for either Ranadeb Bose, Ishant Sharma or Romesh Powar. The Oval does afford spin on days 3 and 4 and so, Powar would be a tempting option to go with. It depends, however, on how Bose, Sharma and Powar bowl in the tour game. England Vs India: Test 2 Day 5 — No coach but many oval beans? This was a terrific team performance by India to win the 2nd Test match against England. It was a good win indeed. And this was achieved without a coach! David Lloyd can whinge all he wants about it being a lucky toss to win, but if England continue to wallow in their self-pity and if they continue to be lured by excuse-mongering, they’ll be in a sorry frame of mind when they go into the 3rd and final Test match of this series at The Oval. Yes, it was a good toss to win. However, by pinning England’s loss on that one event, as the one-eyed — or is he totally blind(ed) — David Lloyd was trying to do would be foolish. I thought both Andy Flower, Englands’ Assistant Coach, as well as Peter Moores, the England Coach, got it spot on when they dismissed the importance of the toss. Andy Flower said that it would be tempting but weak to pin the reasons for the loss on the toss. But overall, the bowling unit performed well. The core unit was supported well by Sourav Ganguly and Sachin Tendulkar too. The Indian batting came good. The openers batted in a truly special manner. That set the platform for the Fab Four to accumulate the runs. This was a wonderful team performance. In the past, several of India’s overseas victories have been set up by only a few people. I can think of Dravid, Dravid and Dravid. Did I mention Dravid, by the way? Think back to Headingly, Rawalpindi, Adelaide and Jamaica. Agreed Laxman contributed big-time in Adelaide and so did Agrarkar with his magic spell of bowling, but without Dravid’s brilliant 70+ in the second innings, India may have lost that one. The only players that missed out were Dhoni and Sree Santh. From all of Dravid’s post match sound bytes, it does appear as though Sree Santh will be given a chop on the knuckles and a dreessing down. Ravi Shastri wanted an internal disciplinary action. I don’t know if the Indian team will go that far. But I do believe he will receive a dressing down. A visit to a shrink may be in order too. Are India poor travellers? Dileep Premachandran and Siddhartha Vaidhyanathan from Cricinfo explode this myth. Suddenly, India’s away record is second to Australia’s! So much for the “stamp the visa and stamp out the team” tag that Team India has had to live with. In the last 10 years or so, ever since Ganguly took over the captaincy reigns, India have won in South Africa, Australia, West Indies, England (twice), Pakistan and Sri Lanka. If we discount the shocking series in New Zealand in 2003, India has won important games in all Test playing countries. Of course, I have not considered Bangladesh and Zimbabwe in this analysis. Indeed, since 2000-01, India has won more matches overseas than it has lost! In that period, India has played 36 overseas matches, won 13 and lost 10! If we ignore the New Zealand series of 2002-2003 and all wins in Bangladesh and Zimbabwe, the results read: 28 matches, won 8, lost 8. This is better than any other team barring Australia! The problem with India has been consistency, continued-focus and retained-intensity. As Dileep Premachandran argues, almost every good overseas win has been followed by a loss! What India needs is to put her foot on the pedal and leave it there. The fact that the team bounced back from the near-defeat at Lords’ to a win at Trent Bridge augurs well for India. The determination to win was there and it was evident. Hopefully India will retain that hunger when they step onto The Oval. There is a chance — a brilliant opportunity — to create history here. I don’t believe the Fab Four and Kumble — all on their last visits to England, surely — won’t want to miss out on this opportunity. I mentioned earlier on that England would be foolish to pin the reasons for their loss on the toss-loss. The reason I say this is because it takes the focus completely away from the ordinary performance of Alistair Cook, Andrew Strauss, Ian Bell, Paul Collingwood and Matt Prior. Yes, the England bowlers bowled well. They bowled under worse conditions than India did. And yet they stuck to their task manfully. However, to ignore the problems that Struass and Cook are having would be foolish. To ignore the impetuosity of Collingwood and Bell in the first dig would be silly. They played atrocious shots when the situation demanded that they respect the conditions as well as the bowlers a lot more. And Collingwood, after getting a start in the 2nd Innings could not keep going. Ian Bell, like Alistair Cook and Andrew Strauss, is in all sorts. Matt Prior should really focus on his game and not on his next sledge. He, like his co-conspirator in the India Team — Sree Santh — appears to have lost the plot. A visit to a shrink would be needed to get him to focus on the next ball rather than the next sledge! Which is why I think David Lloyd is being one-eyed! He needs to open the other eye and realise that there are some real problems that need to be solved; some questions that need to be answered. So, let us head to The Oval. Hopefully we well see some more of those oval sugary beans there too so that Zaheer Khan can get fired up once again. India probably had two objectives at the start of Day-2: (a) to bowl out England for less than 200 runs, (b) to get a good start. Both objectives were met. The first, thanks to Zaheer Khan and Kumble. The second, thanks mainly to the wonderful start that Dinesh Karthik and Wasim Jaffer provided India. It was interesting that Dravid started the day with the use of a heavy roller. Clearly he expects the pitch to break up as the game progresses. Kumble should then come into the game much more compellingly. India batted with positive intent when Jaffer and Karthik commenced. It was most refreshing to see the way Karthik batted. He played a gutsy innings. He also seemed to have got over the perhaps impetuous reaction to sledging that he showed in the 1st Test. He played with purpose and energy. Jaffer was solid at the other end. But once again, once Jaffar got to his half-century, he appeared to go into his shell. Having said that, the ball that got him out was a brute of a delivery from Tremlett. The rest of the batsmen probably paid too much respect to Monty Panesar. Panesar is no doubt a good bowler. However, if they had played him with a bit more positive intent, my feeling is that they’d have ended the day on a slightly better note. The wicket of Dravid, towards the end of the days’ play, may offer England a sligtly open door. India must ensure that the door stays shut and that the foot remains on the pedal — to mix two metaphors! And that must be what the doctor orders for the 1st session of Day-4. India’s intention must be to bat only once in this game. And that would mean a lead of at least 250 runs, if not more. India, at 254 for 3, is 54 runs ahead. So, a further 200 runs — at least — are required. Given the solid platform that Karthik and Jaffar have provided, this should be possible. But as they say, funnier things have happened in cricket! At this stage of the match, after the teams have played out 5 sessions, I’d say that India leads the session-by-session score at 4-0, with one session — the last session of Day-2 — being an even one (in my view), given the late wicket of Dravid. Cricinfo’s Siddhartha Vaidhyanathan, in an excellent analysis at the end of Day-4 of the recently concluded 1st Test between England and India, indicated that India went into the Test with an egg-shaped strength graph but came out of it with the strength graph looking strangely like an hour-glass. And so, we have a strange situation of it being an egg (or a gilli — of gilli-danda fame) turning into an hour glass. Siddhartha Vaidhyanathan’s thesis is that India went into the Test match with its much vaunted middle-order as its key, underpinning strength. What we got at the end of the game was a situation whereby the players that we expected relatively lesser stuff from stood up, put their hands up and asked to be counted. Wasim Jaffer, Dinesh Karthik, R. P. Singh, Zaheer Khan, Mahendra Singh Dhoni and Sree Santh came out of it with their heads held high. The personnel that were expected to slaughter the greenhorns in the opposition had surrendered meekly — twice in one game. It is so true. Tim de Lisle talks about this as Goliaths being in awe of Davids! I suspect that it is a case of IBRADM too. Somehow, the Indian middle order needs to get out of its slumber and deliver the goods. Far too often in recent memory, the middle order has surrendered the initiative through purposeless and listless batting. Sure Englands’ bowlers bowled well. But these are champion batsmen that we are talking about. Sachin Tendulkar, Rahul Dravid, Sourav Ganguly and V. V. S. Laxman have scored nearly 30,000 Test runs between them! They are not wet behind the ears! Surely they can do better. Surely they can turn their 30s into 60s and their 60s into hundreds! The bowlers have shown that they can pull things together — I say this inspite of the horror start to proceedings in both innings. Zaheer Khan bowled well in patches. Sreesanth seemed to have great difficulty bowling to left handers. Kumble was not as penetrative and did not ask as many questions as he normally does. Inspite of these deficiencies, the bowling stuck to the task. I thought Dravid marshalled his bowling resources brilliantly. I have hope that this department will improve in the 2nd and 3rd Tests. If the bowling improves — and they will, I believe — then, what is needed is a rethinking of the batting strategy. India cannot go into the 2nd Test with a “everything will be right” attitude with respect to the batting. Something has got to change. There has to be fresh thinking. There has got to be fresh blood. There has got to be a shake-up. (a) One of Ganguly or V. V. S. Laxman will have to step down and make way for Yuvraj Singh. From what I saw of Ganguly, I observed a willingness for the fight. I saw the fire still burning. He wanted to be in the fight and he also delivered India an important breakthrough with his bowling. I did not see the willingness for a fight in Laxman. He is no Michael Hussey at #6. And so, I would suggest that Laxman sits out this next match. (b) If (a) doesn not happen — for whatever reason — then at the very least, Sachin Tendulkar needs to swap his position with V. V. S. Laxman. For India to go into the next match with the same middle order would be — in my view — a folly. In this 1st Test, against a weak attack, India got out of jail. Surely, India can do better than that! India will go into the 2nd Test in a positive frame of mind. It is certainly better going into the 2nd Test with a scoreline that reads 0-0 rather than 0-1. The bowlers bowled the opposition out twice for under 300. India’s 2nd innings score equalled Englands’ score in the 2nd dig. One could say that but for the crazy first hour, India may have done better. However, the fact remains that the egg-shaped graph failed India — twice. And that is a trend that has existed for quite some time now. This is the right time to start infusing new blood into the team; new blood that will bring with it personnel who want to fight in a real Test of their mettle. This is, I believe, the opportunity to commence the process of ringing in the changes. Dinesh Karthik shows that he wants to be there. He wants to fight. Every outing is treated by him as a gift — and potentially his last outing! We need more of his tribe in the team. The last day of the 1st Test in the ongoing England V India series promises to be a cliff-hanger. Both teams will think that they can win. David Lloyd is confident that England will win. Ravi Shastri thinks that England have their nose in front but believes India can win if they go into the last day in a positive frame of mind. Shastri believes that Dinesh Karthik is the key! Like David Lloyd, I think we are in for an excellent last day’s cricket. The weather could play spoil sport though. The forecast for St Johns’ Wood is for rain with a high of 17 deg C and a low of 14 deg C.
If we get a full days’ play, there should be a result in this game. I don’t think India can win. With Dravid and Tendulkar back in the pavillion and with Jaffer, India’s 1st innings hero, back in the hut, I believe the task will be huge for Karthik, Ganguly, Laxman and Dhoni. India may salvage a draw if the weather helps out too. I would be most happy to be proven wrong though. Jaffer’s was a really soft dismissal. He was playing well — albeit with the IBRADM (India Batsmen’s Recently Afflicted Defensive Mindset) — and Karthik was playing with positive intent. A lapse in concentration combined with laziness cost Jaffer his wicket. Dravid was unlucky to be given out as the ball pitched outside off, but these things happen in cricket. But the worst dismissal of the day, from an India point of view, was Tendulkars’. He should have stayed on till the end of days’ play and he should have been looking to score runs. If he had been looking for runs, he would have played that ball with his bat! Instead IBRADM meant that there was a defensive malaise about his game. I believe it cost him his wicket. It is an uphill task for Karthik, Ganguly, Laxman and Dhoni. India needs a further 243 runs to win. This is not going to be easy on a 5th day wicket. I say this even though Karthik is playing well and Ganguly is playing positively. Panesar is bowling well and the other England pace bowlers are bowling well. I can’t see any of them having a bad day at the office. So, I don’t believe India will make it. Laxman is in a strange no-mans’ land. Dhoni is out of sorts. So, unless either Karthik or Ganguly score a big hundred, I’ll be looking to the weather Gods! Karthik appears to improve with each dig. Yes, he did get out in the first innings and he dropped a sitter to let off Strauss. But the lad appears to want to be there. He seems to look at each opportunity as a gift and wants to make the most of it. His batting in the second innings has been a treat to watch. R. P. Singh has been a terrific positive too. In only his 5th Test match, this young 21-year-old player from Uttar Pradesh has shown tenacity and guile. He has taken his first 5-fer and I suspect that, provided he does not travel down injury-lane, there will be more of these before he hangs up his boots. He has 22 wickets from 5 Tests at an average of 26.90! So these are early days yet, but to get on the honours board at Lords’ at such an early stage of his career will give him much confidence. All in all, it promises to be a fascinating day-5.